There aren’t too many people who can say they’ve won a Paralympic World Cup gold medal from their wheelchair. But, Mike Tagliapietra is one of them. Six years after his 2003 spinal cord injury, Mike moved to Phoenix and started training with a local wheelchair track team. Over the next two years, he completed many marathons and a few triathlons. Although he loved the sport, he realized he wasn’t fast enough to compete at the Paralympic level. During a visit with his cousin in Colorado Springs, Mike visited the Olympic Training Center and spoke with the coach of the Paralympic shooting team, who surprised Mike by offering him a chance to train with the team, and lending him the equipment to get started in the sport. “After that offer, I moved to Colorado Springs and gave myself nine months to make the team,” Mike says. He was named to the team just seven months later, in the summer of 2013. Since then, Mike has traveled the world representing team USA in various shooting competitions. He won his first gold medal in October, 2013 at the Championship of the Americas event in Rio de Janeiro. More recently, he won his first World Cup gold medal at the Sydney Australia event in September, 2015. 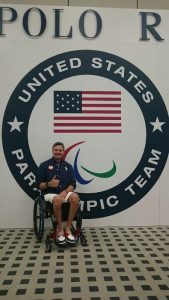 At the Paralympic World Championships in July, 2014, Mike noticed one of his competitors using a carbon fiber wheelchair, which was much lighter and easier to maneuver than the chair Mike had been using. His heavier chair took more effort to push, and Mike had been manually loading the chair and lifting it into his truck whenever he was traveling. He did some research and found the Travis Roy Foundation, where he was granted funds to help him purchase a new wheelchair for everyday use. He loves the chair he received, and appreciates that it lessens the load on his shoulders, which he uses both when getting around and when competing internationally. “I couldn’t have afforded this awesome chair without help from the Travis Roy Foundation,” he says.